At CAP conference, talk of a broad agenda is outweighed by warnings about President Donald Trump. Warren’s keynote address at the leading Democratic think tank’s second annual policy summit reflected how the party is grappling with parallel imperatives ahead of the midterm elections: How to regain their political footing after a shock 2016 election result, and how to channel progressive energy fueled by opposition to President Trump. 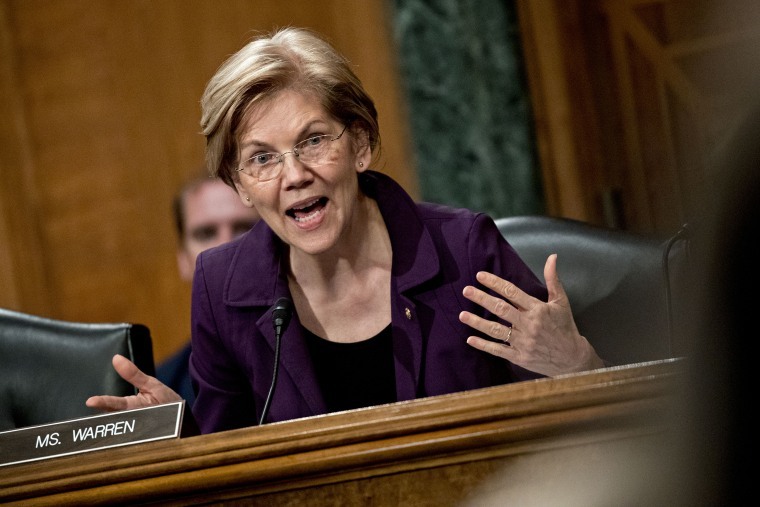 Warren was among those Tuesday who portrayed Trump as an existential threat to the country that must be addressed. Other speakers, some among a long list of potential 2020 Democratic hopefuls, used the opportunity to sketch out a policy agenda to guide the party in the longer term. Sen. Bernie Sanders made a similar pitch, albeit with a predictably unique spin. In a speech that had been billed as having a “focus on criminal justice,” he also ticked through a list of a more than dozen progressive policy goals before saying none of them matter if the “move toward oligarchy” is not halted. The debates within the party were evident, on both policy and tactics. New York Mayor Bill De Blasio used his address to urge Democrats not to shirk from putting forward a bold policy agenda that voters could embrace, as he did when he campaigned to raise taxes on high-income New Yorkers to pay for expanded early childhood education. “This is the great dividing line. If you are a willing to say out loud we need to tax those who have done very well to help everyone else, that proves to people both intent, but also typically some sense of courage,” De Blasio told NBC News in an interview after his address. “American working families are going through a lot," he added. "If Democrats can plausibly say ‘Here’s what we’re going to do to lighten your burden’ and we are consistent about it rather than this grayness which seems to afflict our party so often, I think it will be very appealing to people." “I don’t talk about Clinton voters or Trump voters. I don’t talk about white workers and black workers and Latino workers. I talk about workers and I talk about voters,” he said. Sen. Kirsten Gillibrand, D-N.Y., speaking on a panel on women in politics, delivered an impassioned plea to Democrats not to shy away from gender equality as a core political focus. She said Democrats should look to build on an explosion of grassroots activity and candidate recruitment among women since Trump’s election. In one panel discussion, participants showed daylight on the question of just how forcefully to confront Trump, versus making an affirmative case for the party. Tom Steyer, a Silicon Valley billionaire who has been touring the country to promote his drive to impeach Trump, pushed back on criticism that his approach might only help galvanize Republicans. "I think no matter what they [candidates] say or do, this election is very largely a referendum on the administration and the president. And that’s if you’re running for dog catcher, Congress, Senate, or governor,” he said. Former HUD Secretary Julian Castro, who delivered an address on “inclusive politics,” said he was not worried about a broad array of Democrats proposing “big ideas” that he might not agree with. "I’m more worried about when people think you don’t have any new ideas,” he said in an NBC interview. Sen. Cory Booker, D-N.J., focused his address on systemic inequalities that persist in the country, in the criminal justice system and economy. Other panels highlighted issues like women’s rights, climate change and gun violence that have powered the political resistance, and speakers like Sen. Doug Jones who have won unlikely victories since Trump’s election. “I am the closest thing to a unicorn that exists in this country,” the Alabama Democrat joked.